More coins will be listed on this page over the coming weeks. 1.03.009 FL VAL CONSTANTIVS NOB C Bust B2. RIC 30. 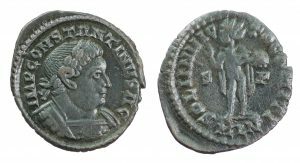 Constantius as Caesar. Scarce early London issue. Very similar to CT 1.03.009 (4). Ex CNG auction 161 lot 280. 3.01.001 IMP C DIOCLETIANVS P F AVG Bust B2. RIC —. Rated RR and the only type for Diocletian in Part 3 of LMCC that retains the C in the obverse legend. 3.01.032 MAXIMIANVS NOBIL C Bust B3. RIC 34. Galerius as Caesar. Rated S with the draped and cuirassed bust. Nice obverse with partial silvering but the obverse a little flat struck. 7.03.007 CONSTANTINVS P F AVG Bust B2 left. RIC 158. Rated R and a difficult left facing bust type for this issue. 7.03.047 CONSTANTINVS AVG Bust B5 (w) left. RIC 182. Rated R. Consular bust issued to commemorate Constantine’s second consulship which started on 1st January AD 312. A little rough but a difficult bust type to find at this price. 7.06.012.5 CONSTANTINVS P AVG Bust D2 (z) left. RIC —; LMCC —. Rated RR. Not listed in RIC and an unknown type when LMCC was published in 2015. We now know of four examples, two struck from the same set of dies. 8.03.001 IMP CONSTANTINVS AVG Bust B2. RIC 21. Rated RR. 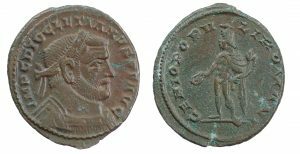 The last ADVENTVS issue which probably commemorates the final visit of Constantine to Britain in AD 314. 8.06.017 IMP CONSTANTINVS AG Bust B2. RIC —. 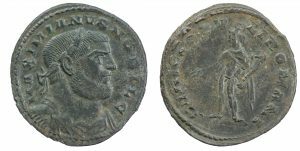 Rated RR and known from a single coin in the Sarzeau hoard. Interesting AG obverse inscription and a scarce spread chlamys reverse for this issue. 8.10.006 CONSTANTINVS P AVG Bust B2. RIC 120. A rare mintmark for London. The discolouration on the reverse is benign and not verdigris. 8.10.010 CRISPVS NOB CAES Bust B2. RIC 122. Rated RR. A rare mintmark for London and a very good quality coin. A combination rarely seen for sale. 8.10.012 (var) FL CL CONSTANTINVS IVN N C Bust B4. RIC 123 var. The rare variant of this type with the colon in the exergual mark – PL:N. This coin is struck from the same dies as the LMCC plate coin 8.10.012 (2). A very difficult type to find. 9.02.023 CONSTANTINVS IVN N C Bust C5 left. RIC 184 cor. Rated R. A very rare reverse type for London with the seated captives each side of a trophy rather than a standard. Although this coin has been harshly cleaned, such reverse types are rarely seen on the market.